Safety is a top priority wherever you are in the world. That’s why companies around the globe are turning to InformaCast to help with their emergency notification needs. 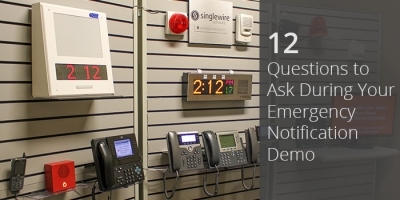 When every moment matters, an emergency notification system that can reach on-premises and mobile devices with the push of a button saves time and speeds up responses. Because InformaCast is developed in the United States, organizations looking to adopt the software outside the U.S. may experience some variations in functionality. 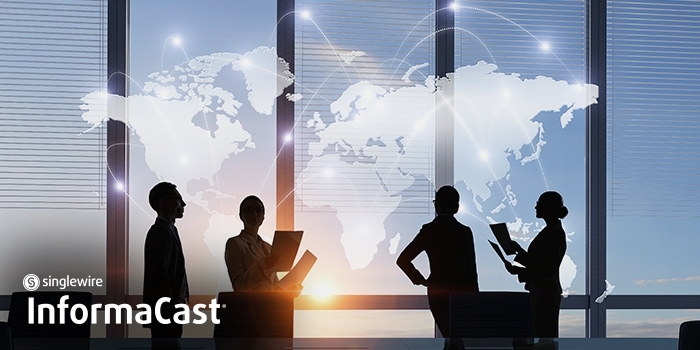 In this blog post, we’ll be answering five frequently asked questions about using InformaCast outside of the United States. Does InformaCast work outside the U.S.? Yes, InformaCast can be integrated in organizations around the world to send emergency notifications. We have over 7000 customers in 60 countries, and those numbers continue to grow as the need for safety solutions becomes more urgent. Functionality may vary for mobile services depending on the country of operation and service level being implemented. Singlewire Software has a dedicated team of territory managers and software engineers who are available to talk through different use cases to ensure wherever your people are in the world, they receive the safety information they need when they need it. How does functionality for InformaCast differ when used outside the U.S? InformaCast Advanced is used for on-premises notification to reach desk phones, digital signage, computer desktops, and overhead speakers with audio and text notifications. Outside of the U.S., this functionality does not change. InformaCast Mobile is our mobile-only notification offering, and InformaCast Fusion combines the features of InformaCast Mobile and InformaCast Advanced. This provides a solution that reaches mobile and on-premises devices with emergency notifications through a single web interface. Due to InformaCast Mobile and InformaCast Fusion leveraging mobile services for notification, functionality becomes highly dependent on local carriers where the systems are being deployed. Most European carriers support the SMS and dialing features available to U.S. customers sending notifications to mobile devices. Carriers in the Middle East and other parts of the world may not be able to support all of these features, but interested customers can consult our mobile rates page to see what features are available in their country. Talk with one of our international territory managers to identify your uses cases and determine which of our mobile service levels is the best fit. Even with certain limitations to mobile features, international customers have found the combination of mobile and on-premises notification offers a powerful means to reach their people when sending emergency alerts. 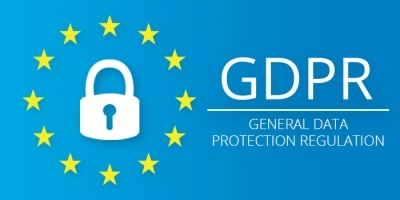 InformaCast is GDPR compliant, giving customers in the European Union peace of mind knowing they have control over how their data is handled. Data processing performed by InformaCast is done at the initiative of our customers when they are utilizing the service. Customers control their data in InformaCast, along with how and when it is processed. Customers may delete or modify their data at any time and Singlewire does not access customer data unless requested by a customer. Are there additional costs for customers using InformaCast outside the U.S? Keeping in line with standard international business practices, pricing for our products is listed in U.S. dollars on our Pricing page. International customers interested in purchasing InformaCast Advanced will have no additional fees applied to their software. 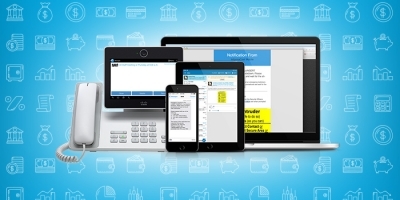 For InformaCast Mobile or Fusion, Singlewire Software grants international customers using mobile services a $75 annual credit for SMS with any charges over this amount billed annually. What kind of support does Singlewire offer international InformaCast customers? All InformaCast customers have access to our support services. Critical outages have access to 24-hour support, but over 90 percent of support cases are non-urgent and are typically addressed within 24 hours of being submitted. Support is available Monday through Friday, 1 p.m. to 12 a.m. GMT. covering a good portion of the business day in most international territories. Customers can call +1.608.661.1140 - option 2 or they can open and follow their case online. Additional hours may become available as our international customer base continues to grow. Please note that Singlewire Software does not install or configure InformaCast. The Singlewire Support Community is available on a 24/7 basis and allows self-service, education, and troubleshooting. It includes highly consumable video tutorials, user guides, and support articles, saving you time and money getting to know and implement InformaCast. Customers and channel partners with active contracts can self-register for the support community at the link below. If you’re outside the U.S. and interested in setting up a demo to see how InformaCast can help enhance safety and security in your organization, please contact one of our International Territory Managers. How Much Does InformaCast Cost?